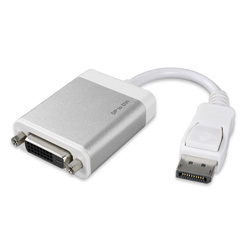 The DisplayPort to DVI Adapter is designed for connecting a DisplayPort embedded device (laptop, desktop and etc.) to a DVI embedded device (television, monitor and etc.). With the DVI and DisplayPort 1.2a specifications, this adapter's minimum video bandwidth is 1.65 Gbps and the resolution is up to 2048 x 1152 pixels. Besides, plug and play design makes it easy to use; no need to install extra drivers when plugging the adapter into the device. Simply attach the adapter to the device and begin using right away.